Nagarajan Muthukumar (12 July 1975–14 August 2016) was an Tamil poet, lyricist, and author. Best known for his Tamil language film songs, he received the most number of Filmfare Awards for Best Lyricist in Tamil and was a two-time recipient of the National Film Award for Best Lyrics for his works in Thanga Meenkal (2013) and Saivam (2014). 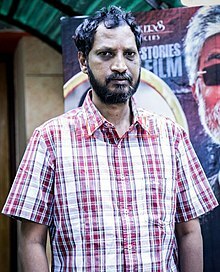 Muthukumar grew up in a village Kannigapuram in Kancheepuram, India. He has a brother Ramesh kumar. At the age of four, he lost his mother and acquired an interest in reading. He began his career to become a director and worked under Balu Mahendra for four years. He was later offered to write lyrics in the film Veera Nadai, directed by Seeman. He has been credited as a dialogue writer in a few films, including Kireedam (2007) and Vaaranam Aayiram (2008). His last movie as lyricist is for the movie "Sarvam thaala mayam" with A.R.Rahman. On 14 June 2006, he was married to Jeevalakshmi in Vadapalani, Chennai. Muthukumar, who had been suffering from jaundice for long, died on the morning of 14 August 2016, at his Chennai residence due to cardiac arrest. At the time of his death, he was survived by his wife and two children: a son and a daughter. ^ MALATHI RANGARAJAN (7 February 2013). "Life's a lyric". The Hindu. Chennai. Retrieved 8 February 2013. ^ "The Lyricist who rocks". Behindwoods. Retrieved 2009-04-16. ^ "Pearls of emotions". The Hindu. Chennai, India. 2007-02-02. Retrieved 2009-04-16. ^ "Na Muthukumar weds – function and pics". cinesouth.com. Retrieved 2009-04-16. ^ "Shocking: Na Muthukumar passes away due to jaundice and high fever". The Times of India. 14 August 2016. Retrieved 14 August 2016. ^ "Na Muthukumar- A song that met an abrupt end". The Times of India. 14 August 2016. Retrieved 4 November 2016. ^ "Lyricist Na Muthukumar passes away". The Hindu. 14 August 2016. Retrieved 4 November 2016.